PIDUK, IPOPI member in the UK, released the findings of a first of its kind patient experience survey that will help them tailor their upcoming activities and can aid National Health Services (NHS) policy-makers, commissioners, and health care providers improve PID care. The results from the survey were published on November 28 and highlight the importance of early diagnosis and access to different treatment options and modes of administration to ensure individual patient needs are best met. 45% of primary immunodeficiency (PID) patients reported that it took up to six years to get a confirmed diagnosis. Delayed diagnosis produces a greater burden on NHS resources due to a higher number of occurrences and hospitalizations and has a big impact on a person’s quality of life. 40% of respondents reported that their PID had caused them to take time off work and 59% stated that they faced extra financial expenses. According to the survey, there may be further opportunity to offer treatment closer to home as nearly half of respondents, 45%, are still receiving immunoglobulin treatment in the hospital. PIDUK is planning their next steps taking these findings into account. 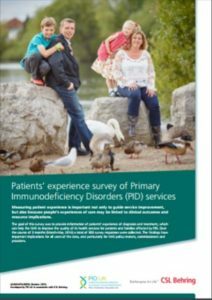 ‘There is much in the report to be positive about but there are also several challenges that we need to address, including time taken to reach the correct diagnosis, lack of joined-up services and the impact of PID on people’s day-to-day lives, for example, financial pressures.’ stated Dr Susan Walsh, Director of Primary Immunodeficiency UK.